It’s a regular day, but for some reason, you can see this coming. Your girlfriend has sent you a text message that reads “we need to talk” and you are almost expecting this to be another request for you to change certain things about the relationship, but it turns out she wants to break up. Before I go on, trust me when I say that I know what you are going through right now. The pain you are experiencing feels worse than any physical pain you could ever imagine. I’m sure this happened recently and you are looking to find a way to get your girlfriend back. You are consumed with questions regarding what she is doing. You wonder who she’s hanging out with and you are desperate to contact her and let her know you want to get back together. STOP right there! Let me start this by saying that you are NEVER going to get your girl back if you contact her now. If you do this now, your chances of having her back in your life are slim to none, and your chances of her wanting a romantic relationship again are zero. Yes, a big fat zero. I’m not saying this to make you feel even more depressed and desperate. I’m saying this because I have the answer to your problems. I was there in that exact same position you are. I was wet behind the ears when it comes to the art of getting someone to want me again. I tried the flowers. I tried the crying for her to feel bad for me. I tried the social media stalking. It all backfired on me big time. Every single time I wanted a girl back after she had broken up with me, I was only successful at pushing her further away. Women have brains that work entirely different from what we think. When they love you, they can’t get enough of you all day long, but when they make up their mind about leaving you, they want you gone for real. Lucky for you, this is exactly what you are going to use to get her back. It sounds crazy, but the no contact rule is a scientific fact. The problem is that most guys have no idea how to do this and they fall into temptation. This will be your guide on this incredible journey to becoming the ultimate desirable guy. You will get your girlfriend to call you by the time you are done with this book and I guarantee it will be out of the need to hear from you. You will make her feel more attracted to you than she ever did even before she decided to leave you. It’s going to be a very difficult road at first, but nothing good ever came out of easy challenges. I promise you that by the time you finish reading the book, you will be a completely new man and you will be the one deciding if you want to get back together with your EX! So why wait? Get your copy now! 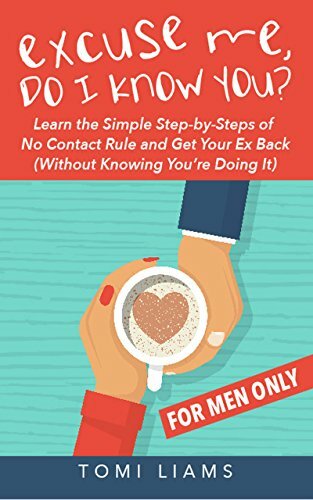 DISCLAIMER: This eBook is not for women trying to get their ex-boyfriends back. Strictly FOR MEN ONLY.